Memsource 6.2 is now live, following the major release 6.0 two weeks ago. This week’s update features the ability to translate Google Documents, to run automated projects, and to use Memsource translation memory in other CAT tools. Adding a Google Doc named ”Academic Edition Manual” for translation. 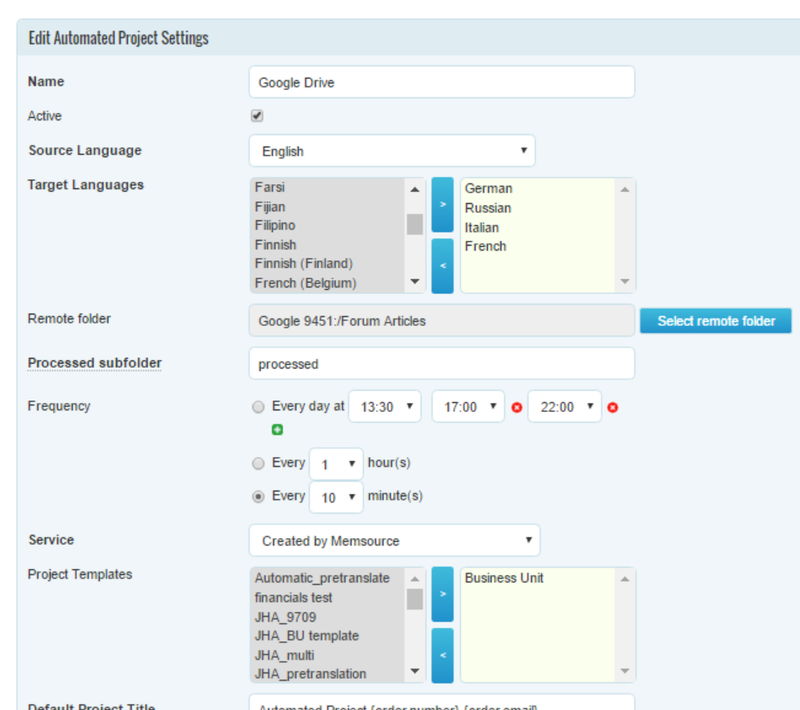 Memsource is able to directly read Google Documents from Google Drive, and create translation jobs from them. Shared documents: In order to add a document that has been shared to your Google drive by a customer for example, you need to first add it to your drive. After a Google document is translated in Memsource Cloud, it will be converted back to Google document format. Manual: to export the translated document back to Google Drive, press “Export to online repository” under the Download menu. Automatic: automatically added jobs will be uploaded to Google Drive automatically to the same location from which the original was taken. It is now possible to upload files for translation from online repositories automatically. Memsource will check the designated online folders, send all newly detected files for translation to an automatically created project, and after the translations are finished, send the translated files back to the location from which they were retrieved. 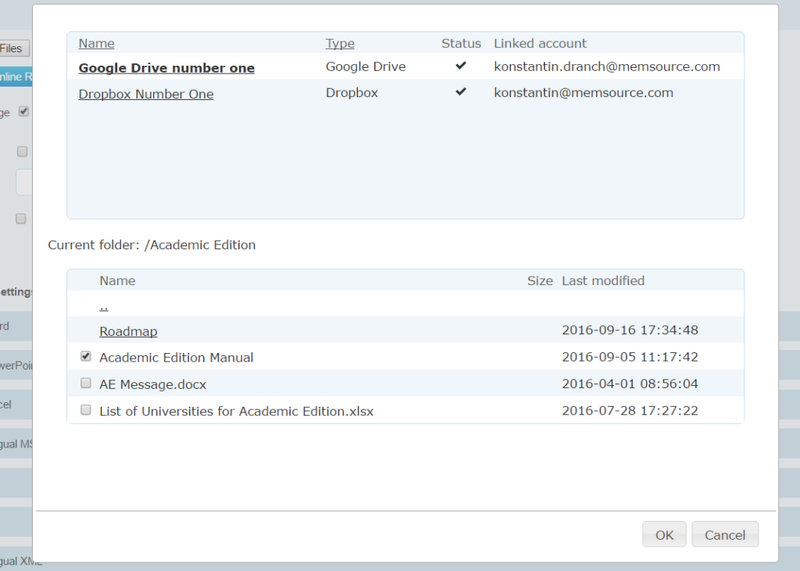 This feature is useful for creating quick integrations with content management systems that can export to a shared folder, translating regular updates to websites. Project managers can attach a pool of linguists or vendors to a project template, and completely automate their process. You can find Automated Project Creation rules under Setup in Memsource Cloud and more details are available in our documentation. This change allows project managers to download translation memory from Memsource and use it in any other CAT tool that supports TMX, including SDL Trados and Kilgray memoQ. Memsource tags in the TMX file exported from translation memory in Memsource, or from a job will be converted to standard TMX format tags , and . However the exchange still not have a 100% fidelity because every CAT tool might have a different way how to handle tags when parsing original document for translation. Linguists may download a TMX from the translation job they have done in Memsource (through Download - TMX) in the project page (unless this option has been disabled by project manager). We recommend translation buyers and clients to encourage their linguists to work in Memsource editors, and stay connected to updates in translation memory and terminology in real time. At the same time, it is now possible to support linguists that strongly prefer their own tool, and are reluctant to switch to the buyer’s technology. Project managers can now completely automated processes with minimal involvement, helping to deliver projects outside of regular business hours. Project Status automation is a complementary feature that works together with the Automation Widget and Automated Project Creation. Previously, projects created via the widget could send jobs to linguists, and the workflow stopped after the translators and reviewers finished their work. Now it is possible to add a set of rules to send the completed files to the client. Please find the setup information on our Wiki. API Async Requests created in Asynchronous API and Translation Memory Asynchronous API will be stored for 14 days. After that period they will be deleted and the information will no longer be available.